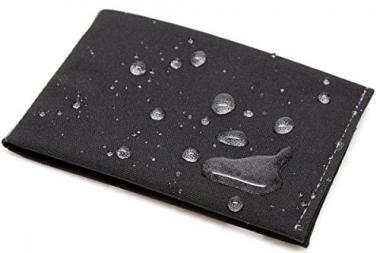 There are many reasons why someone would want a waterproof wallet. Whether it’s going to the beach, riding on a kayak or heading out to the pool, they can be an essential item. The quality can differ from one product to the next, however, and getting the best waterproof wallet is important to keep your items dry. In order to find the best water resistant wallet we have created a buying guide and have also completed waterproof wallet reviews to show you the best products on the market. After you’re finished reading this guide, you’ll have a clear idea of exactly what wallet you need. This is a top rated water resistant wallet from blue sky BASICS that is able to tick all of the boxes in terms of what makes a great wallet. 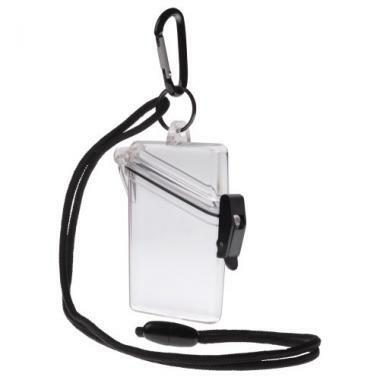 It is completely waterproof and has three separate pouches that are going to allow you to separate your items. Not only is this product full waterproof, but it can also float in the water to ensure that it’s never lost and also it is able to be submerged in the water. One of the best parts of this product is that it has a transparent pouch which you are able to use touchscreen phones through. Witz have been able to produce this waterproof card holder that is going to do an excellent job at holding your essentials. It comes in four different color options that are all translucent to offer you some custom choice. It is able to ensure that your contents stay dry as it is airtight and able to float. A great aspect of this holder is how durable it is. It is able to cope with the harshest of environments and is crush resistant to ensure that anything inside is protected. 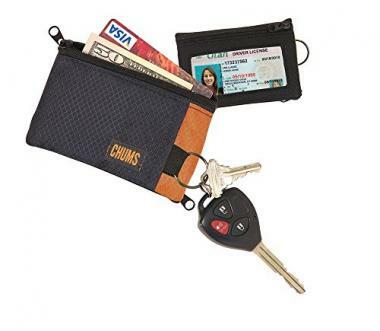 This product from Chums would work perfectly as a surf wallet, as well as being ideal for a vast range of different uses. It isn’t fully waterproof but it is highly water resistant to be able to give you protection from the rain and splashes. The material that it is made from is ripstop nylon which means that it is going to be highly durable and will last you for many years. There are two zipped pockets to separate your car and cash, with an outside window where you will be able to show your ID. This small waterproof wallet is going to be ideal for those who want to carry around notes and cards. It has a very slim profile that is going to make it very easy to carry with a wide range of different activities when you’re near the water. Its waterproof shell is going to be able to protect the insides of the wallet and that is going to be helped by the extreme level of durability that it has. This wallet can also be bought with RFID protection in order to prevent any thefts. 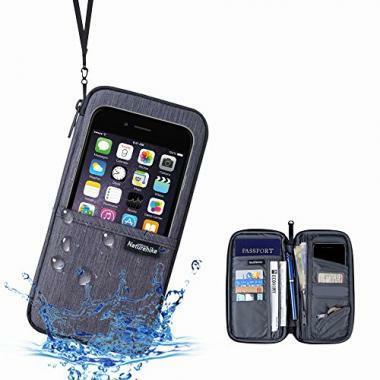 This water wallet will offer a good level of water resistance as well as a wide range of other features to provide you with a high-quality wallet. It’s made on lightweight materials and has a slim design which makes it easy to be taken on a wide range of activities. It also is made of durable materials to keep your wallet protected and on the inside it has interior card slots and also an ID window. This is a high-quality product and one that is very highly rated. It also contains RFID blocking material too. This waterproof wallet for men is one of the most stylish products available and will be able to give you a high level of waterproof protection with its shell. It has two hidden interior pockets that are going to be able to increase the protection offered. It has a minimalist design that is going to be ideal for many water activities. It contains an ID slot to quickly be able to show it and the wallet is also stain resistant too, meaning that this wallet should last you for a long time. This watertight wallet is going to be suitable as a swimming wallet as well as being perfect for a wide variety of different waterproof activities. 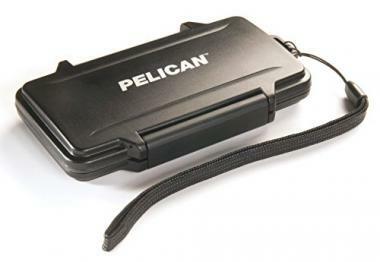 It is made from high-grade plastic and comes with an aluminum shell to ensure you are protected. 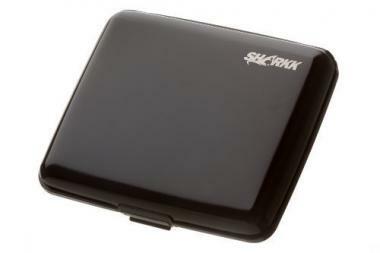 It has a fairly slim design but is still able to hold a large variety of different items. It is also available in a wide range of different colors which all look highly stylish. Overall this is a very tough wallet that is going to be able to keep your cash and cards dry. 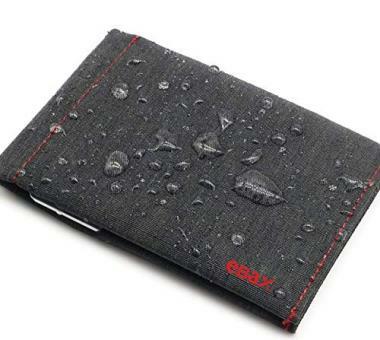 This is another wallet that is highly water resistant but also has a very high level of durability too. The casing of the wallet is also very stylish and comes with a nylon lanyard if you wanted to be able to keep it more secure. The wallet is crushproof and that will give you peace of mind if you are doing any extreme activities. 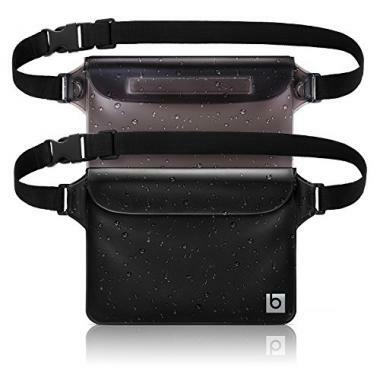 It is able to float so that you will never lose it and it has mesh interior pockets that are going to leave everything in there safe and secure. Dry Pak have been able to make this waterproof pouch that is sure to keep all of your valuables dry. It is four inches wide and four inches high, allowing it to easily be placed anywhere while you enjoy your favorite water activity. An adjustable neck lanyard is included and the wallet will be able to hold ID, cash, keys and many more items. It has a yellow clip which is going to give it a high level of visibility and will ensure that it’s never going to be stolen. This is another wallet that has a high level of style and is available in either grey or black. It has many different internal pouches to allow you to easily store all of your items and separate them out for quick and easy access. 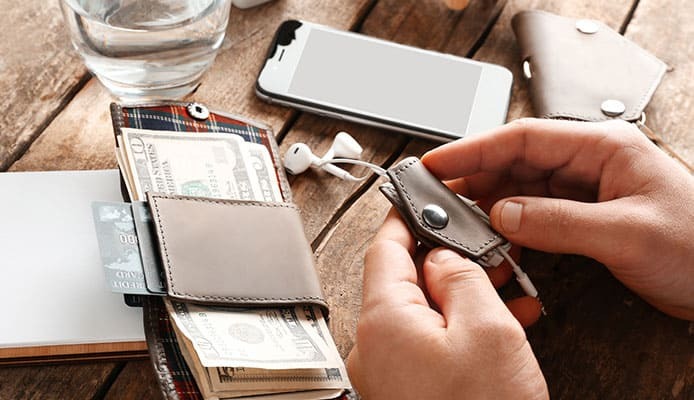 It features a removable cord to allow you to attach it to anything that you need too and the wallet has a waterproof case to keep your contents dry. The wallet is also highly durable and should be able to last you for many years. Whether it’s a waterproof MP3 player, a wallet or a waterproof Fitbit, anything that is designed to keep the water out has to be made out of the best materials. With these wallets, they can be made out of a wide variety of materials as they come in a wide variety of different designs. In terms of the wallets that are designed to look like your conventional wallet, they are often made of a material such as nylon which will then be coated with a waterproof material. This will be able to keep the outer dry but won’t give you full protection. If you wanted to have the best protection here then it would be a good idea to get a waterproof duffel bag or the best dry bag. We see plenty of other materials too such as flexible plastic and aluminum casings. These will all offer different levels of waterproof protection and therefore it’s important to make sure you know what you are getting. Some of these products will be able to give you great protection from rains and splashes, whereas others will be able to be submerged. One of the great aspects of waterproof wallets is that they are going to be able to be useful on a wide range of different adventures. That could be traveling in a kayak, wanting to get on a stand up paddle board for fishing, or you might want to head out on your surfboard. 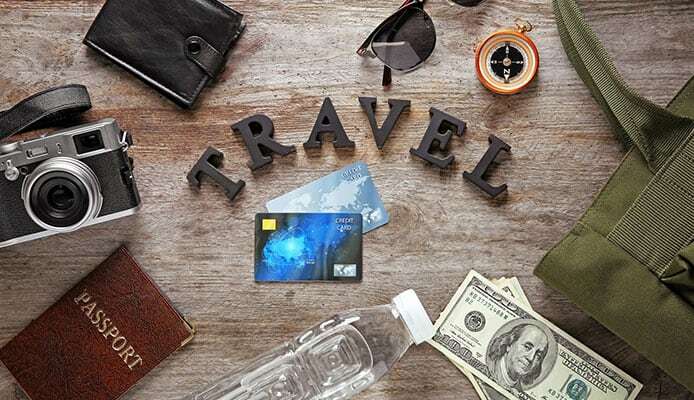 When you have a waterproof wallet, you would be able to do a wide variety of different activities that you otherwise would have been nervous about. A lot of these wallets can also be used for everyday use too and allow you to enjoy the peace of mind that they bring. As well as wallets, there are also other products that are able to offer you this level or versatility too, such a waterproof watch or a waterproof fitness tracker. These are going to allow you to enjoy your favorite activities without the paranoia that they are going to be destroyed by the water. Due to their need for waterproofing, these wallets need to be made with a high level of build quality to ensure that they are able to keep the water out and keep your contents securely in place. One great place to check the quality of a product is the user reviews. Seeing a using a wallet for a brief period of time is one thing but being able to hear from people who have used the wallet for a long time can be very useful. Having a warranty is also a useful aspect to have with these products as you know you’ll be getting a quality product. Some of these wallets are larger and able to hold a lot of contents whereas others are smaller and will only be able to hold cash or cards, if you are looking at getting protection for your phone then getting a waterproof phone case is going to be the best idea. In terms of making a product out of fabric, the stitching is always going to be of vital importance. Without a high-quality stitch, the wallet would quickly fall apart and it wouldn’t last very long at all, this is about both the materials and the build quality. Nylon or polyester thread is going to be the best material that can be used for stitching with cotton being a cheaper material that isn’t going to be as durable. Looking for a reinforced pattern or double stitching is a good sign of high quality. On other waterproof materials, you will often see welded and sealed seams to ensure that they are waterproof. Whatever type of stitching you are going to be seeing, it need to be of the highest quality in order to be as durable as possible. The lining is another aspect of a traditional wallet that is going to be of great importance to the style, usability and durability. This depends on the type of waterproof wallet that you are getting as there are ones with plastic or aluminum that won’t have a traditional lining. On the ones with the more modern and watertight design, they often won’t have any specific segments for cards or cash and will merely be there in order to protect the insides from water that will be trying to find its way in. On the more traditional types of wallet, you will want to look at the inside and check that it is going to be able to organize everything in the way that you are looking for. 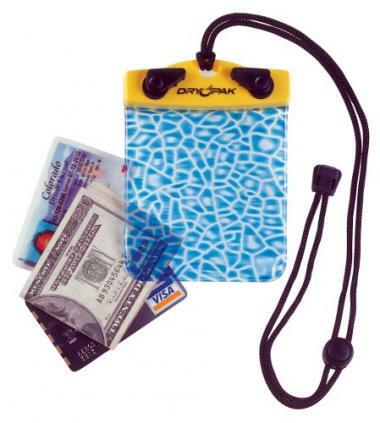 This includes any features such as a slot to place your ID, card pouches and zips for coins. Generally if a product contains zips then it is not going to be waterproof. The reason for that is due to the fact that getting a zip that would provide a tight enough seal to keep water out is going to be waterproof is near impossible. With these types of wallets they will be able to offer a good level of waterproofing on their shell but would offer much protection should they ever encounter a large volume of water. If you’re looking for full waterproof protection in terms of being submerged then zips aren’t an option. There are plenty of products on the list that we have seen here that don’t have any zippers to speak of. Some of these are fully waterproof while others are not, therefore it’s vital that you check this before you decide to buy a wallet. The traditional wallet is one that is going to have a small profile and be able to fit into your pocket. If you are hiking, for example, then having a wallet with a waterproof shell along with products like a waterproof jacket and a waterproof tent will be enough to keep your valuables protected. There are other products that we have looked at here that are a lot bigger in size and ability to hold more items such as a phone and even a waterproof camera. There are great for activities where you are going to be out of the water and need that protection. This is going to be a matter of personal preference and your specific needs. You want to make sure that you know exactly what you need and what items you are going to need to be protected. Once you know this, you’ll have a much greater idea of what you require. 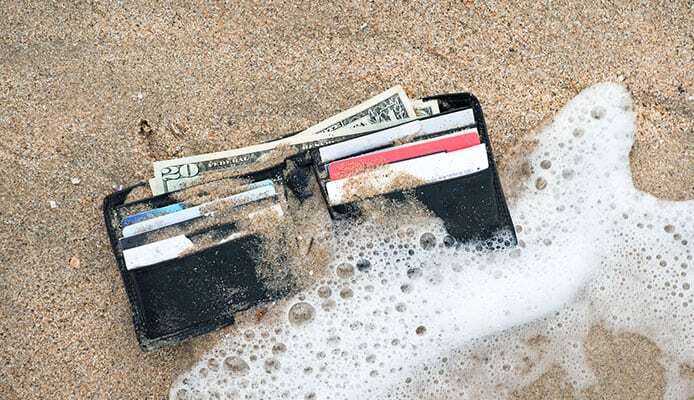 Q: Can I Use My Waterproof Wallet On The Beach? A: Despite the beach often being extremely close to the water, there are many people who will go to the beach without ever getting wet. As long as you have a great beach bag then you would be able to take anything to the beach with you. If you want to be a bit more adventurous, then there’s a good chance that you will be coming into contact with the water. In this case you would want a wallet with a greater level of protection and there is also the important consideration of sand. If a wallet is going to be fully waterproof then it’s going to be resistant to sand too. This is a great feature to have, but any wallet is going to be able to be taken to the beach as long as you take the right precautions if your wallet is not fully waterproof. Q: What Is The Difference Between Water Resistant And Waterproof Wallet? A: The water-resistance vs waterproof debate can be quite tricky with many different areas of hiking, camping and water sports, the terms can often mean different things depending on what types of product it is and different material. If something is described as waterproof, for example, then it could be just that the outer shell of the material is waterproof but the wallet would be able to be submerged. Other waterproof products will have a full amount of waterproof protection and will be able to cope with falling in the water. Water resistant products will be able to hold off the water for a certain period of time but aren’t going to be able to be fully waterproof. These type of products are ideal for protecting against rain or splashes but aren’t ideal for being out on the water. Q: Are Waterproof Wallets Submersible? 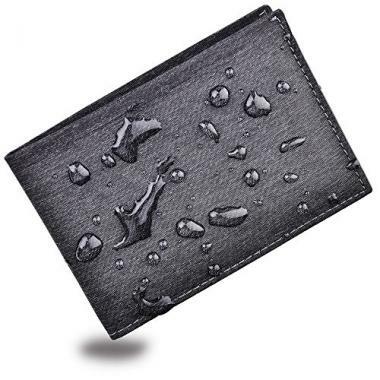 A: The majority of wallets that are described as waterproof aren’t going to be submersible. This is due to the fact that the likes of traditional wallets will only have an outer shell that is waterproof. Other wallets will have a very high level of protection but without being able to be in the water. There are a few models out there though that have a great level of waterproofing protection and are going to be able to be submerged quite far into the water. These will be most ideal for the type of activities where you will be out in the open water. These waterproof wallets can be a great addition to your gear and will be able to keep your cash and cards safe with some being able to offer you a larger capacity of protection and be able to protect your phone and any other devices you might be carrying. Before you buy a waterproof wallet, it’s a good idea to assess exactly what your needs are and what you look to be protecting. This will depend on various aspects such as exactly what type of activity you are going to be doing. This will mean that you need to consider aspects such as the overall quality, the size and exactly how waterproof it is going to be. After you know exactly what you need, you will then be in a position to choose the perfect waterproof wallet for you. Hopefully this guide has given you all the information you need to make the perfect choice for you. Once you have, you’ll be able to head out to the water safe in the knowledge that your valuables will be protected.